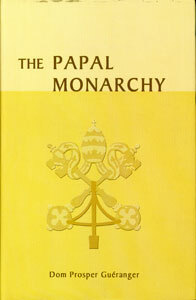 When nineteenth century Christendom shifted its allegiance from a divine vertical authority to the horizontal revolutionary ideals of egalitarian democracy and false liberty, Dom Guéranger’s erudite polemical masterpiece contributed more than any other contemporary work to uphold the papal monarchy in all of its divinely ordained prerogatives. This labor of the holy abbot helped to restore in Catholic Europe the spiritual sword, as well as the magisterial cathedra, to the Vicar of Christ the King. And he did so, not by any clever manipulative abuse of language, but simply by appealing to the simplicity and clarity of the gospels, universal Christian tradition, and the common consensus fidelis. The brilliant hypothetical scenario, drawn by the author, of a college of a dozen apostles, called by Christ, but without a “Cephas” (a Rock) in Peter and his successors, presents even the infant “collegial” church in such an unenviable plight that one might pity them even more than one might pity the Methodists or Seventh Day Adventists, had any of them been at the marriage feast of Cana. "You have rendered an extremely useful service to the Church by undertaking to refute the main propisition (of the Gallican conciliarists), and by demonstrating their hostile, impetuous , and contrived character; you have accomplished this with such solid arguments, such brilliance, and such an abundance of evidence drawn from sacred antiquity and ecclesiastical science, that — conveying many things in few words — you have proved empty the pretense of wisdom of those who have wrapped their opinion in ignorant talk." — Brief of Blessed Pope Pius IX to Dom Guéranger concerning the publication of The Papal Monarchy. No decade of the 19th century in France was without its heroes of the Catholic Faith. This is not to speak of the many saints produced in that nation during those hundred years, numerous of them long since canonized and others yet to be. But, we speak of bishops, priests, religious and laymen who set about rebuilding and then fortifying a Church whose total destruction was sought by the Revolution that had exploded politically in 1789, was already spreading around the world, and intended to become – as by our day it has generally succeeded in doing most everywhere in ex-Christendom – the dominating influence in the lives of individual men by substituting itself for the Faith in the life of society. In the middle of the century, Dom Prosper Guéranger, Abbot of the Benedictine monastery of Solesmes, was in the first rank of these heroes. He marched there alongside such fellow warriors as Edouard Cardinal Pie, Bishop of Poitiers; Ven. Fr. Emmanuel d’Alzon, founder of the Assumptionist Fathers; and Louis Veuillot, the journalist. Besides being fellow warriors, they were all personal friends. If they and others like them are hailed here as heroes, it is a measure of how far the Church must go before she is again fully herself that most Catholics today, following the lead of too many limp-wristed clerics, would probably brand them as “fanatics” and the virile religion they upheld as “intolerant”. This even as it has become commonplace to describe the pope of the era, though today he is officially a Blessed, as the “infamous” Pio Nono. Born in 1805 and deceased 70 years later in 1875, Dom Guéranger’s chief contributions to the renewal of the Church in his time and within France were the revival of French Benedictine monasticism, which he accomplished nearly single-handedly, and helping establish the Roman liturgy in place of the hodgepodge of diocesan rites that had prevailed since the rise of Gallicanism. For the Universal Church Militant he oversaw the rescue of pure Gregorian Chant, a precious treasure that was almost lost. More importantly, together with Louis Veuillot he did as much as anyone to beat back opposition to the definition as dogmas of two Catholic beliefs which, once defined, became de fide – “of the Faith”. That is to speak of beliefs men must hold in order to be able legitimately to call themselves Catholic. These beliefs become dogmas are those of the Immaculate Conception of the Blessed Virgin Mary, defined by Bl. Pope Pius IX in 1854, and papal infallibility, which was defined at an Ecumenical Council called the Council of the Vatican when it was summoned in 1869 by the same pope, but known by Catholics as Vatican I ever since that disastrous convocation of forty years ago, Vatican II. It was in his daily journalism in the newspaper he edited, l’Univers, that Veuillot did his part to drive opposition to the definition of the dogmas from the intellectual field. Dom Guéranger’s weapons were two books. Memoire sur l’Immaculee Conception served in the case of the one dogma. La Monarchie pontificale served in the other. Not available to English-speakers before now, despite its importance, the latter work now lies open before the reader in a wonderful, brand-new translation. Though it often may be extremely difficult for us to see it and therefore believe, Heaven does always know what it is doing. That Papal Monarchy has finally become available to English-speakers at the beginning of the 21st century when it never was before, and especially to English-speakers in America, must be the work of Providence. Heaven doubtless perceived that whatever the state of the Faith in this country in generations past – Has it ever been really robust? – at least papal infallibility was not questioned in America, or not questioned openly by anybody who mattered, for decades after the dogma was defined. That being so, a book like Dom Guéranger’s was scarcely needed. Now that the dogma is not so much questioned as ignored, like so much else, it will prove invaluable. The book was written, first of all, in rebuttal to a two-volume work by Bishop Henri Maret, dean of the Theological Faculty of Paris, who signed it in the style of his titular see, Bishop of Sura. Then, before Dom Guéranger was done writing, the formidable Felix Dupanloup, Bishop of Orleans, the recognized leader of liberalism in Catholicism in the French episcopacy, came out with a book, and the Abbot of Solesmes completed his own by speaking to it. All of these books were appearing on the eve of the opening of Vatican I. They were meant to influence Catholic opinion in general, and the views of those who would attend the Council in particular. Catholics of a certain age will remember that there was a similar jockeying of books for influence prior to Vatican II. One of the most notable on the “conservative” side was The Plot Against the Church, by “Maurice Pinay,” pseudonym of the priest and author Fr. Saenz y Arriaga. Designed to thwart a planned Modernist hijacking of the Council by exposing it beforehand, it failed. 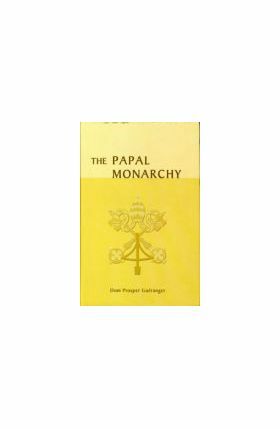 Insofar as the bishops opposed to the definition of papal infallibility were driven back at Vatican I and Papal Monarchy contributed materially to their rout, Dom Guéranger’s book was a spectacular success. It was the objections to definition raised by the Bishop of Sura that cried the loudest for Dom Guéranger’s correction in 1869. That is because Bishop Dupanloup, like Cardinal Newman of England and Americans at the Council who were not flat-out opposed to definition, did not object to the dogma as such, or so he and they claimed. They objected to definition on the ostensible grounds that it was “inopportune”. If their objection became moot the moment a majority of the Council Fathers voted their approval of definition, a variation of it has arisen in recent years, and not from among liberals. Some Catholics calling themselves “Traditional” are taking the line that the dogmatic definition of papal infallibility was not so much “inopportune” as unfortunate. Thus, Dom Guéranger’s treatment of Bishop Dupanloup’s book is as timely for us today as the arguments and scholarship he marshals to rebut the Bishop of Sura. Now that not merely “some” Catholics are “saturated” by the ideas of liberal democracy but nearly all, it behooves us to be explicit in a way Dom Guéranger was not as to why definition was desirable, and as to why, more than two centuries after the Revolution began to unfold, our gratitude for what was done at Vatican I ought to be limitless. Of all the ideas of liberal democracy adopted as a “pattern” for the life of the Church and by individual Catholics for the conduct of their own lives, none has been more pernicious than that of “freedom of conscience”. The poison of it was already widely spread by the time of Vatican I. In our day, the Mystical Body of Christ, the Church, is so full of it that the “cafeteria Catholic” is less an exception than he is typical. This is the man who accepts some Church teachings and rejects others (especially ones against something he wants to do), but fancies that he remains fully Catholic. To make matters worse, he can do this virtually without danger of being told by anybody – certainly not by most priests nowadays – that he is wrong. The one party left who certainly can and will tell him, at least when he teaches authoritatively, is the Pope. Indeed, the one who currently reigns, John Paul II has condemned cafeteria Catholicism and, by implication, the “freedom of conscience” it manifests, repeatedly. We may also be grateful to Dom Guéranger for providing the majority of the Fathers of Vatican I with the ammunition they needed in order to prevail at the Council, and providing us with the same for occasions when we are confronted by self-described Catholics who go beyond ignoring historical papal teaching to opposing it outright. As for those who persist in ignoring it, we really should not concern ourselves with them, or the outright opponents, as much as we sometimes do. They scandalize us, yes, and scandal invites correction as Dom Guéranger corrected the errors of the Bishop of Sura. But if our correction is ignored as readily as papal teaching itself, we do better to invest our time and energy elsewhere than in obsessing over the doings of men of ill will. Things ultimately will work themselves out, Dom Guéranger explains why, apart from the fact that error always eventually exhausts itself, we can be confident of that. He watches. His mercy, the name by which we have known His love since the Fall, will endure forever. Accordingly, so will His Church, the vehicle He has provided for our salvation. The infallibility of His Vicar on earth, the Pope, guarantees as instruments of salvation the Church and the Sacraments she provides, and their permanence. That is what Dom Guéranger tells us. Now that the sway of the Revolution is nearly universal so that no considerable part of the world any longer remains Christian – Which people could still be called Catholic without their protesting? – the message provides a comfort and assurance to us as individuals that scarcely any other can. Dear son, greetings and Our apostolic blessing. It is truly regrettable, dear son, that there are among Catholics certain men who, while glorying in this name, are thoroughly imbued with corrupted principles, and adhere to them so resolutely that they no longer know how to subject their intellect simply to a contrary judgment of this Holy See, even when that judgment is corroborated by the general consensus and recommendations of the Bishops. Instead, thinking that the progress and happiness of human society depends entirely upon those principles, they endeavor to incline the Church to their opinion, and, imagining that wisdom is theirs alone, they do not blush to designate by the name of “the ultramontane party” all the rest of the Catholic family which thinks otherwise. Indeed, they take this madness to such extremes that they set out to recast even the divine constitution of the Church and to adapt it to more recent forms of civil government, so as to diminish more easily the authority of the supreme Ruler placed over it by Christ, whose prerogatives they dread. For this reason they boldly advance certain pernicious doctrines which have been condemned repeatedly, as if there could be no doubt about them, or as though they could be freely taught, at least; from old proponents of these doctrines they scrape together historical quibbles, mutilated passages, calumnies hurled at the Roman Pontiffs, and all sorts of sophistries. With the utmost impudence they bring all these things up again, completely setting aside the solid arguments with which they have been refuted a hundred times. Their purpose is to agitate minds and to incite the men of their faction and the ignorant crowd against the general consensus of the others. That being the case, besides the harm that they have caused by troubling the faithful and reducing the most serious questions to the level of marketplace conversation, We are compelled to deplore their foolishness, which is equal to their audacity. For if they firmly believed, with the other Catholics, that an ecumenical council is governed by the Holy Spirit, and that can it define or propose dogmas to be believed only by His inspiration, it would never have occurred to them that things which are not in fact revealed or which are harmful to the Church could ever be defined as matters of faith, or that human maneuvers could ever impede the action of the Holy Spirit, or prevent the definition of truths which have been revealed and are beneficial to the Church. They surely would not assert that it was forbidden to propose to the council Fathers, in a suitable manner, the difficulties that they consider to be in opposition to this or that definition, so that the truth might emerge more clearly from the debate. If this were their sole motive, they would henceforth abstain from the stratagems by which votes are customarily gained in popular assemblies, and they would tranquilly and respectfully await the result of illumination from on high. Therefore, in Our estimation, you have rendered an extremely useful service to the Church by undertaking to refute the main propositions in writings of that sort, and by demonstrating their hostile, impetuous, and contrived character; you have accomplished this with such solid arguments, such brilliance, and such an abundance of evidence drawn from sacred antiquity and ecclesiastical science, that – conveying many things in few words – you have proved empty the pretense of wisdom of those who have wrapped their opinions in ignorant talk. In re-establishing the truth of the Faith, of right reason, and of history, you have acted in the interests of believers, whether learned or uneducated. We express therefore Our gratitude to you for the gift of this volume, and We predict an auspicious and very wide circulation of the work which you have produced by lamplight. As an augury of this success and as a pledge of Our paternal benevolence, We impart to you with great affection Our apostolic blessing. Given in Rome, at the Basilica of St. Peter, March 12, 1870, the twenty-fourth year of Our Pontificate. It is a fundamental principle of theology, that all revealed truths were confided to the Church at the beginning; that some were explicitly proposed for our belief from the start, whereas others, although contained implicitly in the first set of truths, only emerged from them with the passage of time, by means of formal definitions rendered by the Church with the assistance of the Holy Spirit, through Whom she is infallible. It follows from this that in the study of positive theology, which is the basis of Scholastic theology, as we survey the monuments of ecclesiastical antiquity, we must not be surprised to encounter among the ancient writers some opinions more or less opposed to some points of doctrine which were later the object of a definition. Thus one finds, in the writings of a great number of Fathers, certain statements which in their day were still permitted, but which have since become unacceptable. The authority of these holy doctors is in no way diminished thereby with regard to other points of their teaching, because the error into which they may have fallen, being merely material, could not be prejudicial to their formal orthodoxy. In conducting the study of dogmas through the early centuries of the Church, it is necessary, therefore, to pay close attention to the period in which the Church perceived the need to settle its doctrine on one or another point. Until that date, the language could be more or less vague, either because the doctors had neglected to attain precision on a question which nobody was discussing, or else because they had innocently held an opinion which, because of a subsequent decision, became heterodox. At the same time, we encounter in antiquity some explicit testimonies which are in favor of the future definition and which, at the proper time, will be gathered and form a catena or chain, so that the truth solemnly declared will be based simultaneously upon the sensus communis of the Church, which is always guided by the Holy Spirit, and upon certain traditional texts, formulated long before the definition had reached maturity. On the subject of the rights of the Roman Pontiff, which are manifestly exercised from the very beginning of the Church, neither the popes nor the councils had thought to define anything explicitly, until the Greek schism – which was not accomplished until the eleventh century, and which stressed the denial of the rights given by Jesus Christ to Saint Peter and his successors – had made it necessary to state precisely the Faith of the Church on such an important point. The Second Council of Lyons and the Council of Florence, in their explicit definitions, formulated the Catholic doctrine on the papal monarchy, and God willed that, on these two occasions, the Greek Church and the Latin Church found themselves united in drawing up this common profession of Faith. The former, therefore, which wishes to have the Church’s doctrine clearly defined as to the rights of the papacy, has only to study the decisions of these two ecumenical councils and in this case, as in every other case of this type, to interpret the documents and the writings of earlier times according to the definitive judgments, and not the judgments according to the writings and documents that preceded them. Now, His Excellency, Bishop de Sura has done the second. Following Bossuet’s argument in his “Defense of the Declaration”, he has gone looking for proofs for his system in the periods preceding these two councils, seeking to lend an impossible degree of importance to facts which took place many centuries before the decisions in question. Even if he were in a position to prove, at least, that controversies concerning the infallibility of the pope, and the superiority or inferiority of the pope and the council with respect to one another, existed from the time of the general councils held in the East, one could still reply that, since these councils formulated no decree on the papal prerogative, one must still consult the two councils which dealt with it ex professo, in order to find out what this prerogative is. Yet not one word in all of antiquity reveals to us that these theories – unknown to the Fathers of Ephesus, of Chalcedon, of Constantinople, etc. – were ever debated before a relatively modern era, and then only in the Western Church. Photius in the ninth century, and Michael Cerularius in the eleventh, quite simply denied the primacy of the Roman Pontiff over the other bishops, and the East never intended to enter disputes about the questions that divide the Gallicans from the rest of the Church. Therefore, if one wishes, one can rule out in advance by the same principle numerous pages by means of which Bishop de Sura would like to prove to us that Gallicanism is present throughout antiquity. The prelate does not cite one single conciliar act to which it might have been in conformity, and he refrains from mentioning a hundred others that are explicitly along the lines of the decrees of Lyons and of Florence. He puts aside, as well as he can, the testimonies of the Fathers of the Church, of which he cites only a few, although there is a cloud of such witnesses, and he does not see that, by reason of the decisions of Lyons and of Florence, these testimonies assume a new character of certainty and become fused with the explicit faith of Holy Church. The host of facts, which Bishop de Sura has accumulated and presented in a light that is far from being genuine, could delude those of his readers who are strangers to ecclesiastical science; the others will not be surprised by it. They know that for most of the theses condemned by the Church at Trent and since, the fomenters of the proscribed doctrine have always been able to assemble a rather large bundle of texts and facts predating the definitive judgment, and that they have not failed to do so. They have made thick tomes out of them – witness, for example, the Hexaples de la Constitution, which the appellants [those who appealed from the judgment] published in six volumes in quarto (Amsterdam, 1721). Erudition, certainly, is not lacking in them; on the other hand, one can be sure of not finding there the passages from the Fathers who in such great numbers give evidence in favor of the doctrine vindicated by the Bull Unigenitus.